Women’s soft compression bra from London-based luxury athleisure wear label, Pepper & Mayne designed with a striped monochromatic ombré print. 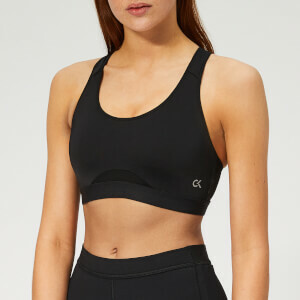 Ideal for yoga, pilates and ballet barre, the bra is created using the latest seamless technology for a supportive and flattering fit and comprises a compact spun yarn construction for durability and effective moisture-wicking to keep you dry and cool while you work out. Featuring a built-in under bust support with a ribbed, elasticated hem and removable soft padded cups, the bra is detailed with a round neckline and racerback silhouette. Finished with a Pepper & Mayne logo discreetly embroidered at the back in silver metallised thread.